Home » Tom and Susan came back from New York with some inside scoop! If you are thinking about making a trip up to New York City, we’ve got the perfect itinerary for you! A little fitness, a fabulous show and an exquisite Italian meal, what could be better? 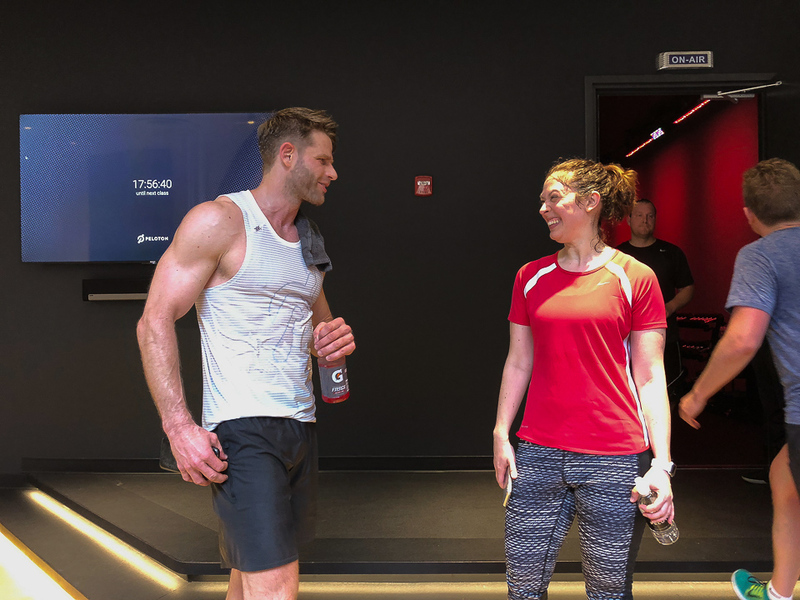 Peloton, the famous indoor cycling company with streaming live classes is coming out with their new product…the Peloton Tread. We got an up-close look at it, and Susan did a 1-hour bootcamp class in the studio with instructor Andy Speer. What a workout! It combined walking, jogging, sprinting, and off-the-Tread strength and stretching exercises. There was some serious sweating going on! The Tread has a low-impact shock-absorbing belt and a 32-inch HD touchscreen. It should be out in the fall. We got our Peloton bike in February of 2016 and absolutely love it. In addition to the Tread, Peloton is really stepping up its game with its app Peloton Digital. Even if you planned a trip to Manhattan only to see the Broadway play Come From Away, you’d leave happy. The Tony Award-winning true story of how 7,000 passengers were stranded in Newfoundland after 9/11 isn’t on most people’s radar. But it should be…it’s very funny, moving, sad and uplifting with great songs and a fast-paced and creative production. You’ll leave entertained and feeling better about humankind than when you came. Susan even got an autograph from cast-member Caesar Samayoa outside the theater. He was super nice and played Kevin J, and Ali in the show, which is playing at the Gerald Schoenfeld Theatre. After the show, we went to a highly recommended Italian restaurant in the West Village called L’Artusi. It’s the sister restaurant to Dell’anima, another one of our late-night favorites. The romantically lit dining area is dominated by the long white marble bar that seats 30. We got two prime seats at the far end and were treated to an excellent meal with top-notch service. The menu is a “modern take on traditional Italian cuisine”. We sampled a small cheese combo, charred octopus, butter lettuce salad, the Orecchiette and the Tagliatelle. Everyone was genuinely friendly and made us feel as welcome as if we were regulars. L’Artusi is open until midnight on weekends, so is a perfect after- theater choice. What are your favorite things to do in New York? Let us know!